The absurdity of the Midland Walmart story in which the store had to be closed because of plumbing issues is amazing. In Midland, the Walmart is closed and we see a plethora of military activity at the store. Since when did the military service Walmart plumbing? Yet, there are some Americans who still believe this cover story. All roads related to Jade Helm lead to Midland, Texas. Midland is at the heart of Jade Helm. If Jade Helm could be turned back in Midland, the globalists would have to find another means to subjugate the American people. In the past several days, I have talked to six people from both Midland and Odessa, Texas. Some of these people form the economic backbone of the area, and they have figured out what is coming. I know there have been multiple private conversations about what to do about the growing Obama administration cancer growing right in their backyard among local business leaders. In Midland, the number one Walmart, with regard to per capita spending in America, is suddenly closed, without warning, fires its employees and the former store is now a hotbed of reconstruction and military activity at the site and is crawling with military and the DHS personnel and vehicles. Where is the outrage? From local business leaders, I have been able to ascertain that the cover story regarding Walmart’s faulty plumbing being the reason for the closure is a complete fabrication. The Midland, TX. Walmart had its plumbing updated six months prior to the closure of the store and no new plumbing permits have been obtained. Unfortunately, every person I have spoken to is afraid to put their name on what they know to be true. They want to tell their story, but they are afraid of any consequences associated with standing up, exposing tyranny and doing the right thing. In this time of extreme crisis, we do not have the time to play games. If one is not willing to speak out and be accountable for their statements, then do not masquerade as a freedom fighter. Since Saturday morning, I have spoken with five men and one woman and each one expressed fear and concern that they and their family would be victimized if they spoke out and they told what they knew. I am looking for people with courage in Midland who are outraged by this takeover and are willing to investigate and go on the record. To the people of Midland, Texas, your city has been taken over by the Obama administration. Some of you are feeling the consequences of the takeover, the rest of you will soon feel the consequences of the takeover. Despite the fact that you will soon live in modern day Auschwitz, you remain relatively silent. Many of your people are being used to retrofit this Walmart, the economy has negatively been impacted by the closure of the Walmart, the military vehicles are at the closed Walmart for all to see and yet, the business and political leaders of your community “don’t know nuthin”. Right now, today, there should be people in the streets protesting the military takeover of Walmart in Midland. Instead, we have a couple of people with video cameras attempting to covertly get the word out about the military invasion that has come to their town. Look at the following videom it is shaky and unprofessionally produced, however, it shows the world what is going on in Midland where evil is triumphant because good men and women are saying nothing. In the following video, please fast forward to the 22 minute mark, which is a must watch. At the 22 minute mark, Pete Santilli reports on his talk show how he has inside information that Walmart, Facebook and the DHS, (Editor’s Note: Pete has the documentation to support his position), have partnered to install facial recognition software in every Walmart because at some point in time, 85% of all Americans go into a Walmart. (Pete’s report can be accessed at the 22 minute mark on the tape). In the same Santilli presentation, he played an ABC report which stated that plumbing permits for the closed Walmarts were not acquired and that includes the Walmart in Midland, TX. Coincidentally, the following video also references the great work done by Deborah Tavares on Future Strategic Issues/Future Warfare (Circa 2025). I say coincidentally, because Deborah was a guest on my show last night and she spoke of these revelations. On page 101 of the report, available at Deborah’s site, there is a reference to the fact when we take vaccinations, we automatically have a bio-identifier implanted in our system that can be scanned to identify where we are at any given time. I have learned from my sources, that these markers are not totally reliable because they can biodegrade over time. Yet, the intention is clear, DHS is attempting to tag us before they bag us. My sources tell me that the Walmart Supercenters are going to be used as a multi-purpose facility. The Walmarts that are open will indeed be used to identify everyone who enters their store and the information will be instantly relayed to DHS. Therefore, if you are a person on the Red List, you better stay out of Walmart. In fact, all Americans should be encouraged to stay out of all Walmarts. It is not just Walmart that Red Listed people must worry about. The problem for any people who have been “Red Listed” is that they do not know how many other public venues will have the same capacity for facial recognition. Four years ago, when I was investigating Intellistreets technology which included plans for DHS to install facial recognition software in every traffic camera and light pole, I learned that most traffic cameras are already tied into the NSA and DHS database with facial recognition. There can only be one reason to possess this technology and that is to identify and to eliminate political enemies of the state. The military term “Purple Command” means that a facility has a joint use function. For example a military base may play home to the Marines and the Air Force. This is looked at as a cost-savings measure. However, it is also a means to unify the military under one strategic command in a Gestapo type of approach that will be needed to control the military and its personnel in the coming purge. 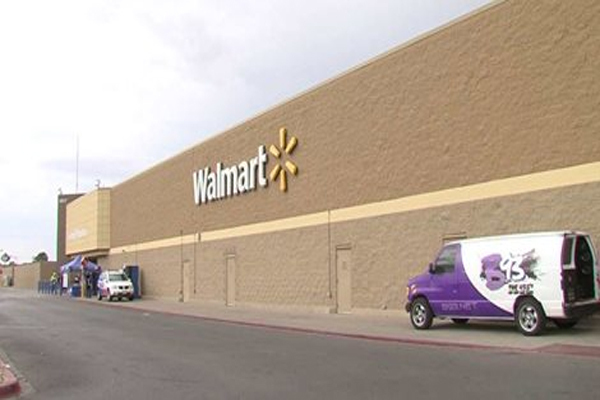 The Purple Command structure of Walmart, at this point, appears to be two-fold. The Midland Walmart as well as the other closed Walmarts, as I have identified before, have been converted into a military logistics operation. It is clear that tunnels are connecting the Walmart under the guise of plumbing supplies. Additionally, an inordinate amount Walmarts are located near railroad tracks and this certainly helps to confirm this intention. The question that is not being answered in these Walmart conversions is what is the Obama administration preparing for? I will address that issue in the conclusion of this article. Back to Midland for a moment, I was told by two people that there is construction going on inside the Walmart in which many of the product shelves have been replaced by much bigger and much more sturdy shelves capable of sleeping two at a time. This was their words not mine. This speaks to a second purpose for this Walmart and that would be slave labor. Does this sound far-fetched? It does not when one considers Executive Order 13603, issued by Obama, which calls for “unpaid consultants” to do the work assigned to them by the Department of Labor in Section 502. Again, the credibility of this part of the report is compromised because both parties were too afraid to provide any identifying information. My media colleague, Paul Martin has been told EXACTLY the same story and Paul is not afraid to use his real name. People of Midland, your community has been invaded by the Obama administration and you need to put eyes on this Walmart and begin to release credible accounts that can verified. You will never know if you could turn this back with enough attention unless you try. All Jade Helm roads to lead to Midland. In this former Walmarts lies the clues which tells us where the Jade Helm crisis is headed. The latter development, listed above, with the notation of the installation of sleeping facilities speaks to the fact that we are looking at the second (purple) purpose of the Walmart takeover and that is most frightening of all. The closed Walmarts will be used as work camps for the receipt and distribution of military hardware. This explains all of the military vehicle activity we see at the Midland Walmart. What are these Walmart centers and the 133 closed Target centers in Canada preparing for? Who are going to be the combatants> That will be the topic of tomorrow’s article.